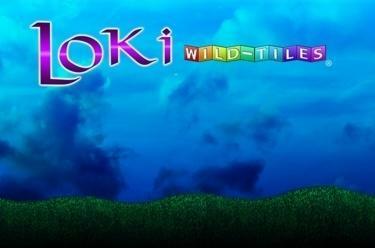 Play Loki Wild-Tiles online for free now! 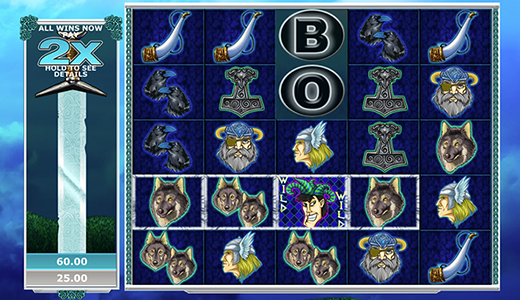 The slot Loki Wild-Tiles introduces you to Norse mythology on 5 reels with vertical and horizontal winning opportunities. The charming god Loki, protagonist of this slot, harvests the highest winnings for your player account. Your aim with Loki Wild-Tiles is to land 5 matching winning symbols side by side in a row or column of the reel set. Loki acts as Wild symbol in the slot: he substitutes for any symbol in combos of 3 symbols. Loki Wild-Tiles is unlike other slots: there are neither win lines nor spinning reels. In each game the symbols fall onto the reels from above. If this results in a winning combo, the middle symbol in a combo of 3 is replaced by a Wild symbol and the remaining symbols are dissolved. Symbols fall into the empty spaces from above. If this creates another winning combo the procedure is repeated, if not a new game is started. Each win in succession increases the winning multiplier; you can view the multiplier to the left of the playing field (sword). To unlock the Bonus Feature you have to clear a column with “Bonus”. If you succeed you earn 10 free games with bonus symbol, the Golden Loki. When 5 or more matching symbols land in any reel position you bag a win. 5 or more Loki symbols win additional free games! The clever trickster god Loki has crept into a slot to pull some divine pranks. We welcome him with open arms, because now we can present to you Loki Wild-Tiles, a slot with winning chances galore: plenty of multipliers, a generous and frequently appearing Wild symbol and a profitable free game feature on top. Needless to say, there are plenty of awesome Norse mythology-themed symbols as well!